Amazing SE Cape Coral location with short access to the Gulf of Mexico, within minutes from downtown Cape Coral, fabulous split floor plan with three bedrooms (1 king, 1 queen and 2 twin size beds) with two bathrooms, one bathroom functions as a convenient pool bath, west facing swimming pool/area, completely remodeled, 2 living rooms, granite in kitchen with wood cabinets, tastefully furnished and decorated, you will love this vacation home. 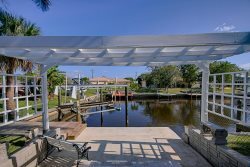 Fantastische SE Cape Coral Lage, nur wenige Minuten von Downtown Cape Coral gelegen, direkter Zugang zum Gulf von Mexico, grosses Haus mit 3 Schlafzimmer (1 king, 1 queen und 2 twin size Betten) und 2 Baeder,2 Wohnzimmer mit genuegend Platz fuer die ganze Familie, grosse Pool Area mit beheiztem Swimming Pool der Richtung Westen ausgerichtet ist, wirklich ein tolles Ferienhaus. Great property. Excellent for families. We really enjoyed the indoor-outdoor feel. We spent as much time around the pool, jacuzzi, and lanai as we did in the house. Had a great stay. The family really enjoyed the property. We may be back some day if we dont buy a Cape Coral property first. :-) Nice town. What a wonderful vacation we had while visiting the Sunshine Erin in Cape Coral, Florida! The property was beautifully clean and decorated. We felt right at home in so many ways. From the super comfortable beds to the well stocked kitchen, we could always find what we needed to prepare meals and have a relaxing family vacation. The backyard pool and hot tub were toasty warm and super clean. We enjoyed watching the sunrises and sunsets from the gorgeous enclosed patio. The garage is extra deep so that our Ford F-150 crew can truck fit all the way inside. It was nice to have the ability to keep the truck secure in the provided enclosed garage. The washer and dryer on site were so nice to have. There is no need to overpack because you can always do laundry in their clean machines. We were especially grateful for the kind attention given to us by the Vesteva Vacation property managers. It turned out that the property pool had an unexpected problem with the pump. Not only did Vesteva respond and take messages on Christmas, but also had the problem fixed the next day! They truly have Awesome customer service. They also provided a well laid out binder guide to review all polices and procedures of the property. It was nice to have in case of any quick reference questions. We would highly recommend the Sunshine Erin as a place to stay in Southwest Florida for a wonderful vacation. Our family of two adults, two teens and two dogs had so much fun!! Thank you Vesteva and Sunshine Erin!! Sehr zu empfehlen. Alles wie beschrieben und top gepflegt. Sehr zu empfehlen. Alles wie beschrieben und top gepflegt. Sehr schnes Haus mit tollem Pool. Sehr schnes Haus, alles top. Gerne wieder ! We are very pleased with all the members we were in contact with! Steffen Wetter was very professional and friendly! We had a wonderful time! The house and the pool was fantastic! The surroundings were peaceful and beautiful. Everything we could ask for were supplied! Would recommended to everyone! Wonderful location and beautiful home...would stay at this property again!! !